As we are always very concerned about our guests, we want to keep you posted on the coolest parties this weekend in Berlin. Some of the coolest clubs like Berghain and Tresor are listed up with fantastic parties. Read on and make sure to be in Berlin this weekend!! A thing you need to know, to make your party night perfect: Clubs in Berlin usually open around midnight, don´t go to early, than you will find an empty dancefloor! Rather go to some nice bars and pubs to warm up! The night is young and in Berlin you can really party till you drop :)! 1.Klubnacht – P.A.S Record Release Party at Berghain/Panorama Bar: This Saturday!! Berghain is THE most legendary club in Berlin! The party starts at midnight! A cool club that comes with great party nights. Indie rock and electro music! The club is located close to a lot of nice smaller bars! Our advice is to go to a couple of bars, to warm up first, and then go to the club for a good dance! 3. Gretchen, a brand new CLUB!! start your Saturday night with awesome FAST FOOD!! The best burgers in town. Even the vegetarian Burgers are TOP! Afterwards go dancing in the diamond lounge, it´s the white noise club! A truly famous club, Tresor, located close to Staion Jannowitzbrücke, in a huge old fabric hall! This Saturdayit is Partysan Night, doors open at midnight! In the years-long tradition of our lengthy friendship and cooperation with the mighty Partysan crew, we welcome them once again in our home to push some musical limits, bring your body to new dancing dimensions and as usual, break through genres and styles with a program that offers something for everyone’s taste. The night holds very special delights on the Globus Floor: the esteemed Parquet Recording chief Solee aka Normen Flaskamp; plus Marco Fender, Andy Kohlmann, Danilo Schneider and Fred Brumme. Making your way downstairs and through the tunnel, you will recognize the Crusty Sounds of Djane Crusty and two Partysan residents Felix Würz and DJ Tuulz rockin’ the basement walls to the maximum, creating a Saturday night atmosphere of pure techno magic à la Partysan – brought to you by Tresor. Dance Dance Dance! Dj´s Knueppel & Kabolz! Disco Wave House Tech 70´s to now! 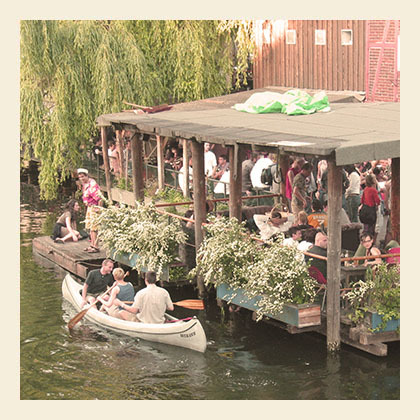 This club is within walking distance from the EastSeven Berlin Hostel! It has a real GDR FLAIR. Ask our staff at the reception for directions :)! LIVE MUSIC FOLLOWED BY A GREAT DANCE NIGHT!! 10. Kill all Hipsters! Party and Live Music at LEVEE! Enjoy your weekend in Berlin!! For a nice place to stay in Berlin come to the EastSeven Berlin Hostel! !